(From Canon lens literature) This easy-to-use standard zoom lens can cover a large zoom area ranging from 24mm wide-angle to 105mm portrait-length telephoto, and its Image Stabilizer Technology steadies camera shake up to three stops. Constructed with one Super-UD glass element and three aspherical lenses, this lens minimizes chromatic aberration and distortion. The result is excellent picture quality, even at wide apertures. Canon's ring-type USM gives silent but quick AF, along with full-time manual focus. Moreover, with dust- and moisture-resistant construction, this is a durable yet sophisticated lens that meets the demands of advanced amateur photographers and professional photographers alike. This has been one of the most-requested lenses on the site for us to test, so we're very pleased to finally be able to share our test results with everyone. - And what a lens it is! This will come as no surprise if you've read the glowing user reviews below, but it's always good to see our test results fall right in line with users' experiences. Early samples of this lens had flare problems when shooting wide open, but Canon stood behind their product admirably, and provided free fixes to all owners affected by the problem, and current production models have good flare characteristics. While still a nuisance to have to send your lens in for repair, it's nonetheless great to see a manufacturer take such a proactive stance towards making things right for their customers. In our testing on a sub-frame camera, the 24-105 ranged from astonishingly good at 24mm to merely excellent at 105mm. At wide angle, this lens is exceptionally sharp from corner to corner, even wide open. From f/4 to f/8, sharpness is superlative, diminishing only slightly at f/11 as diffraction limiting comes into play. As you move toward the telephoto end, the lens gets slightly softer up to about 70mm, and then maintains that level of sharpness more or less unchanged until 105mm. At 105mm, it's slightly soft wide open, improving when you stop down to f/5.6, but then softens slightly again as you continue to f/8 and beyond. Still though, even in ranges where it's "soft," it's noticeably better than most zooms you'll find. Worst-case chromatic aberration is a bit high at maximum wide angle, but the low average levels there point to the CA being confined mostly to the corners. CA drops to very low levels over most of the rest of the lens' zoom range, rising only slightly at 105mm. Geometric distortion ranges from moderate (~0.6%) barrel at 24mm to slight (~0.2%) pincushion from 50-105mm. The zero distortion inflection point occurs right around 35mm. Shading (aka vignetting) is exceptionally low, well below 1/4 EV at all focal lengths and apertures. Paying a lot of money for a lens won't always buy you great performance, but the Canon 24-105mm f/4 L is one lens that easily justifies its price. NOTE: We also tested this lens on full-frame Canon EOS-5D: Click the "Full-Frame Results" tab above to see those results. As always when moving from a sub-frame camera to a full-frame one, the 24-105mm lost a little sharpness in the corners, and chromatic aberration, distortion, and shading all got somewhat worse. That said though, corner sharpness and CA were both much better than most zooms we test, and stopping down to just f/5.6 made dramatic improvements in sharpness. Worst-case chromatic aberraton did increase noticeably, but the average CA levels remained very close to those we found on the 20D body, once again suggesting that the worst CA is limited to a relatively small area around the edges and corners. The bad news with this lens comes in the areas of distortion and shading (vignetting). At 24mm, barrel distortion increased to a very noticeable 1.2%, while the pincushion distortion from 50-105mm jumped to 0.5% (also very noticeable, we personally find pincushion much more obtrusive than barrel, although neither is exactly welcome). Light falloff took a huge jump, reaching a level of more than 1EV at 24mm and f/4, and decreasing only gradually as we stopped down. At longer focal lengths it was less, but still on the order of 1/2 EV wide open. While this is an exceptional lens on sub-frame cameras it falls to merely "very, very good" on full-frame bodies. The good news though, is that this lens is well supported in DxO's Optics Pro software: As of this writing (in late July, 2006), profiles are available for the 124-105mm for the 1Ds, 1Ds Mark II, and EOS-5D, as well as for the EOS-20D and 1D Mark II and 1D Mark II N. We haven't run our test images through Optics Pro, but venture to guess that much of the distortion, vignetting, and CA will be handily dealt with, not to mention most of the softness in the corners. Bottom line, the Canon 24-105mm f/4 L is a really excellent optic, but one that struggles a bit along the edges and in the corners with full-frame bodies. As such, it's an almost ideal candidate for use with DxO Optics Pro, particularly if you're shooting with a full-frame dSLR. My very first premium lens and it exceeded my expectations. The image quality is superb, with a slight distortion open wide (but that can be fixed in post-process anyway). Its build quality is good as well, with a proven capability to withstand bad weather. When I use it for video, its AF (coupled with my Canon 70D) and IS features work really well. When I use it for portraits or events, the f/4 and focal length on the longer side (80 to 105mm) also create quite a pleasant bokeh. It does come with some flaws. I certainly observe lens creep when it's not in use. Though I love the versatility of this lens, the weight of this lens hinders me to take it out for strolling in the cities I'm traveling to. But if you're not going to bring this lens for hours of walking around, it might very well be the lens of choice. The 24-105mm has an interesting price - mainly if you consider buy it in a camera kit. I think this is one of the best bargains in the Canon's set of lens. With canon producing several new lenses lately I thought I would report my experience with the 24-105. My experience with this lens has been very positive, I have used this excellent lens extensively over the past 2 years with a 5D mkiii for travel, sport and family. It has performed faultlessly with excellent image quality and IS. It is just a great general purpose, robust, go anywhere lens, and although on the heavy side balances nicely on the 5D. I like having the extra reach over the 24-70. I bought this lens to replace the 24-70 L 2.8, because I had some problems with it. The 24-105's image quality is a bit worse than the 24-70s under the same conditions. But you pay less money for a better focal length and in everyday life definitely better pictures (due to IS and reduced flare in backlit conditions). The physical condition is flawless and justified the price. I made ​​the decision to buy the 24-105s and give back the 24-70s and never looked back. To get an idea for quality professional wedding photography where you need a good range and good quality, look at my webpage http://www.two-in-love.ch The couple from the side with the mountains was shout with the 24-105mm. Anyone who compares this lens with Canon 24-70L f2.8 should be aware that this lens is wildly popular due to its versatility. Zooming in from 24 mm to 105 mm IS HUGE... You can cover almost any genres of photography from landscape, portraits to formal events. Image quality is great, unless you pixel-peeped (but I doubt people aprreciate your photography artworks by pixel-peeping). If f4 is too slow, you can always compensate loss of light with an external flash. If you own Canon 6D, 5D MKIII or 1Dx, then pushing your ISOs higher (6400) won't be a problem at all. Many people said that at 24 mm it is distorted, but to my eyes it is highly usable. If critical, you can always use a little bit of post-processing to correct the distortion. I'm a Canon camera user. I've never had a problem with a Canon camera or lens until a couple of weekends ago when I started getting an Error 01 ( lens cannot communicate with camera ). It was erratic but when it happened I had to regroup and shoot again. It got progressively worse until I had to stop using my Canon 24-105 F4IS L lens all together. I contacted Canon and got the procedure to send it to them. It cost me $36 to box and send via UPS. Canon acknowledged receipt of the lens in a couple of days. In two more days I got an email stating that the lens was out of warantee and would be $336 to repair. I approved the repair and the money was debited from my account. Two days later I get an email and a call from Canon Repair that they will have to replace the barrel of the lens and the estimate was now $536. This lens is $1100 full retail. Once I restarted my heart I called Canon and disapproved the repair. They will send the lens back to me in a week or so. I can't afford a new lens and I can't afford to pay 1/2 the price of the lens to get it repaired especially when the lens was not damaged due to any mishandling by me. It is a reported problem with this lens that the wiring harness in the lens comes apart after a period of use. Canon refuses to acknowledge this defect. I wish I had enough clout to make it uncomfortable for someone at Canon ! I'm now shooting with a 'lesser' quality lens and will be saving up for an 'off brand' lens instead of the 24-105. Exelente Qualidade de Imagem, muito agradável distância focal, além de uma sólida construção. Best lens in it's class on either sub-frame or FF.My "go-to" lens.Classic L lens quality and optics.Wonderful! none really to me, price perhaps? I am thrilled with this lens. I use it mounted to a Canon 40D and it is my primary studio and outdoors lens for shooting people (model portfolios) and animals. The IQ is superb, it is a joy to shoot movement with. The colors are phenomenal and the clarity is perfect. Its a lens that demonstrates why you should spend the extra money on your glass, there is just no way to express the value I find in having the color and IQ of this lens, even compared to some of my top of the line (non L Series) primes from Canon. The IS is a great benefit as well, and it is ultimately why I went with this lens over the 24-70. I just did not need the extra speed, I wanted the IS over this range. I find the bokeh very pleasing and the DOF to be the right amound of "story telling" over F4-F8. Overall, I am just extremely pleased with this lens. Its worth the money for sure. This was my first lens which came package with my 5DMKII. While it was nice to have a wide range from 24-105mm I wasn't impressed with the AF. I found it difficult to lock in a target with decent contrast. I sold the 24-105mm and got the 24-70mm - BIG difference! I prefer the 24-70mm over the 24-105mm for many reasons. Faster, sharper on the edges and never had issues with the AF. The 24-105mm is a good lens... but there are better in the Canon line-up. Bought this lens to go with 7D as walk around lens. Excellent IQ on sub frame sensor. Very sharp, IS works well. Build quality is excellent. So far no complaints. this is my only L lens, and the speed at which it focuses is in a class of it's own! and the image quality is v good too. i shoot with a 450D, so it does feel a bit front-heavy when in use, but that's not a major problem. Light, f/4, IS 3 stop, good range 24-105, very sharp, good for travel. I had a lot of satisfaction from this lens. That I have by the end of 2006. I brought this lens all over the world becoming very successful. The 24-105 Excellent for travel and reportage Photograpy. Very good for portraits. Slightly less sharp at 105mm, but not by much. It's a great thing Canon bundled it with 5D MkII. I bought this lens as standard lens on my 40D. An I wasn't disappointed. It is simply great. The IS is perfect and it really helps as F4 isn't really that wide. But managing times around 1/8 with 105 mm, that is really great for me. I didn't do any lab tests, but in real life, I don't see any annoying distortions. Some CA but not critical, and the sharpness is overall very very good. At long end, wide open is a point softer than before, but it remains still excellent. My second L lens and not my last. I have had 3 copies of this lens. The first and second soft & I returned them. A couple of years later after reading positive reviews I decided to try again & when it just wasn't up to par with my 40D I sent to Canon for calibration - it came back sharp but until I put it on my 5D I didn't appreciate the full possibilities. Just an outstanding lens on the 5D - it lives on my camera and has produced many gorgeous photos. I personally have not been happy with it on a crop camera. Pricey for f/4. Wide end requires post-pro. I purchased this lens after I a dicey night photographing a concert with a non-canon f/2.8 lens, whose AF couldn't keep up. I noticed, however, that my 70-200 f/4L had a much higher hit rate, and more keepers despite the loss of one stop. So I took the plunge on the 24-105 f/4L and what a difference! Even in low light, the AF is fast and sure, especially when I switch to AI servo and turn on AF expansion. This lens is used on a full frame 5D. To summarize: excellent low-light performance, and exceptional camera-to-lens interface. Optically, this lens produces sharp and contrasty images, and the IS performs extremely well. I feel that it does exceptionally well at capturing people and have had a rewarding experience with events photography (weddings, concerts, some coprorate work). The bokeh produced by it's 8-blade diapragm I find to be extremely pleasing. At the wide end, there is vignetting and (as one would expect) some barrel distortion, and these require post-processing. Canon's DPP v3.2 and up has built in lens correction algorithms, so this is a one-click fix. Other software tools also will make short work of this (Photoshop, PT Tools, DXO). My only gripe is that this lens is offered at nosebleed f/2.8 pricing levels, otherwise I would have given this a perfect score. I bought mine for less as a fully-warranted Canon factory refurb from my pro shop - I probably would not have paid full fare for f/4 at current msrp. But you needn't worry about its performance in low light. Other than a slightly darker viewfinder, it's a superb low light performer. And a future camera body with a live view OLED screen (and/or EVF) will moot the viewfinder issue. ...this is a great lens. It is really crisp and sharp with good contrast, the 400D focuses well with it, the IS works really well, and the only thing wrong with it is that it doesn't have enough wide-angle to be a true GP lens. It's worth every dime. I took mine back because the place I bought it from sold it for $300 over 10 other places on PriceGrabber. But for $900 it's a great deal, given the currently available lenses. Yes at F4 its a tad bit slow but the IS is good enough to shoot it at 1/6s, 1/4s handheld. I will say that with any lens that you buy for the 400D, your bigger problem will be the focus accuracy. Being an L lens, optical & build quality expectations are all met. The IS is the one feature that would make this zoom more useful than the 24-70 f/2.8. AF is very fast & accurate due to the ring USM, as expected. The zoom range is very nice, although I find that 24mm is still not wide enough on a 1.6x FOVCF body for my needs. Some might complain of rather unpleasing bokeh at the tele range wide open, but that is subjective. Overall, a very good lens to have as a walkaround if you don't need more wide angle. I like this lens a lot. It's somewhat of a tough choice for me to choose a favorite between this and the 24-70mm f/2.8, because, while I really like the versatility of the big aperture on the 24-70, I tend to prefer a bit more length on my everyday zooms. So, I typically use the 24-105mm for everyday outdoor photography, and I use the 24-70 for everyday indoor photography. So far, I haven't really felt like I needed IS on the 24-70, but in a couple of cases, IS has come in handy on the 24-105 because that little bit of extra length leads to slightly more unsteady hand-holding. This lens is a bit smaller and feels a fair amount lighter than the 24-70. Just as a small quirky preference, I do tend to favor the fact that this lens has the typical "longer-on-zoom" barrel extension, as opposed to the 24-70 which has the opposite, and odd, feature. I have found on a number of occasions when using this lens indoors that the IS does allow me to handhold this and take shots that I would normally need the 24-70 f/2.8 lens, but this is only for static subjects like museum art, and not animated people! There's not much one can say differently about this lens that you wouldn't say about another L-lens . . . it's well-built and solid-feeling, it has a super-fast and silent AF, it makes very sharp pictures with great color. I personally prefer a little extra zoom, and this certainly provides that, especially on a1.6 FOV camera, but because of the slower aperture (f/4), I tend to keep this for use in the outdoors . . . which is where the extra zoom is more useful anyway. This lens has become my main lens, that stays on my 5D most of the time. I can't say enough good things about this lens. Optically great even at wide apertures. Flair is well controlled. The focal range is much more to my liking than the 24-70mm, and the IS makes it a icing on a very nice cake. The slight vignetteing, and the barrel distortion that occurs at the 24mm possition is a non issue to me, because I am able to fix it so easily in Photoshop with the PTLens plugin. Often times I don't even notice it, even without fixing it in PS. All around a truely GREAT lens. One that will go down in Canon history as GREAT and classic lens. It's a fantastic balance of a reasonably fast aperture, a very pleasing zoom range, relatively light in weight and size, along with fantastic IMAGE STABILIZATION. Normally, I use a D70, but at work, I am "forced" to use a Canon 5D, which was purchased together with a 24-105 IS lens. I don't think one could say anything about it in terms of optical and build quality, after all, this is a professional lens. Sharpness is great, focusing speed is amazing and the stabilization compensates for the extra weight (this lens is pretty heavy). It has the usual 72mm filter diameter, which can make filters pretty expensive, but if you've paid around 1200 dollars for it, I don't think filters will be a problem. If you have the money and want a professional all- purpose lens, go for it. You won't regret it. This is the ideal walkaround lens on full-frame, and it's still fast enough to be usable in low light on full-frame cameras since those cameras are so fast. It makes a decent walkaround on 1.6 crop if you don't need a true wide. I really like mine. The only negative thing I can say is about the zoom mechanism. It started out really stiff, but gradually loosened up so much it now zoom creeps when pointed down. On APS-C DSLR it's almost perfect - comparing to other canon lenses it has some yellow-green colour cast on photos - wasn't able to fix it thru various RAW converters. Still the cast is almost invisible, so there is nothing to worry about. On FF the lens shows some issues - distortion&vignetting at wide end wide open (from F4 thru 6.3). Anyway, highly recommended for APS-C! I purchased this lens after reading tests and reviews for several months. I am an amateur photographer and I needed a not-too-expensive lens to complete my 70-300 F4.5-5.6 IS in the wide-angle range. I actually got much more than that. I got a superb, compact lens which now sits on my DigitalRebelXT (AKA 350D) almost all the time. I was already familiar with good image quality (look at the test results of the aforementioned 70-300 to see what I am talking about), but I was nonetheless stunned when I saw the pictures taken with this lens. Color is rich and natural, pictures are tack-sharp even if taken with the lens wide open, bokeh is very good. Overall, pictures taken with this lens are very pleasant to look at. There is some mild distortion at the 24mm end, but nothing to be afraid of IMHO. 'L' glass is really up to its fame. I was also impressed by how fast and quiet the autofocus is, thanks to its ring USM motor. It can go from macro zone to infinity *and back* in half a second or so. Under normal circumstances it focuses in less than a quarter of a second, even in dim light, and focus is always very accurate. Full-time manual focus is a plus, but I don't actually use it very much. Plenty of words have been spent on Image Stabilization, so I won't cover the subject in detail. I will only say that it works perfectly, and it is darn useful. One of my major concerns when I chose this lens was that 24mm could be not wide enough on a 1.6 crop sensor. After 8 months of shooting I can say that I almost never found myself in need of a wider angle lens, and in those rare cases I used my 18-55 kit lens. I found that this lens is both wide enough to capture large subjects at the 24mm end, and long enough to shoot candids and portraits at the 105mm end. This makes it a perfect walkaround lens. Some might find the f/4 aperture not fast enough. To those people I would recommend to have a look at the 24-70 F2.8L. However, that lens is way more expensive and I personally was (and still would be) willing to trade that extra f-stop for this lens' 35mm longer zoom. The only (small) nuisance I could find is that if you walk with your camera on your shoulder and the lens pointing downwards, the barrel will slowly extend itself, increasing the risk of being hit. However, during normal usage this lens won't extend by itself. It will not, for instance, spoil your framing if you take pictures pointing downwards. I have not given full marks to this lens' IQ and constuction quality because I am aware that there are sharper (i.e. the 24-70L) and better-built lenses (for example, those with inner zooming are more robust). However I did give it full marks globally because this lens adds versatility to professional IQ and robustness. I would definitely recommed the 24-105 F4L to amateurs looking for just ONE good lens (and able to afford the price, of course), and also to anyone tired of carry along an heavy photo bag full of lenses during walks or travels. This is my first "real" lens, to replace the kit lens that came with my XTi; my photography experience is limited, so I can only draw on so much for comparison. It works perfectly for what I want - a very good, mid-range zoom lens with some of the best glass available. It has a great zoom range for walkaround photos, and the IS makes up for the f/4 apeture. It makes my relatively lightweight body (XTi), into something that requires a bit more handholding. I'm not sure if I'd be willing to go hiking with this lens because of the weight. However, it's lighter (by about 10oz) than the 28-70 f/4L that it competes with. I did some side-by-side comparisons between this lens and the Canon EF-S 17-85mm f/4-5.6 IS USM at various focal lengths and f stops, running the raw output through DxO for final conversion. This lens is definitely sharper and had better color rendetion at all points, however, had more barrel distortion at the 24-30mm lens. Overall, I'm very happy with the lens and would highly recommend it to anyone. Nothing at all. Maybe expensive. I bought this lens to substitute the 17-85 IS, that I did not find so good due to the very high distortion at 17mm. It's a bit bigger than the previous one, but it's still an excellent lens for travelling. I like to take pictures in low light conditions, and this lens is probably the best possibile solution for this kind of photography. I use it for the 80% of my shots and I am very happy of it, in spite of the rather high price. - very sharp at all apertures. I did some "lab" tests and it prove ~1 inch front focus, but in real life never encounter problems. I keep this lens most of the time on my camera with an UV protection filter that I change with a polarizer when need. In order to keep the very good lens quality, the filters must be also top quality too. The price of the lens was high, it drops a little bit today, but the quality is not cheap at all. I got both this and it's brother the 24-70/2.8L. Although I really really can't say anything bad about this lens, I ended up favoring the 2.8L because I prefer the one stop light advantage over IS. That being said, though, if you don't mind f4 then this lens is perfect - 24mm (my favorite! ), super image and build quality, and IS - all in a nice (relatively) compact shell. I love this lens! After having my gear stolen last month, this is the only lens that was stolen that I repurchased. Great zoom range. 24mm might be too long on a crop body, but I love it on my 30D. It's wide enough for me. Great all-round lens for 1D2. People report a little distortion on the short end but I can't really see it. Overall a VERY nice lens to have. A little strange bonus is that when I put my Kenko 1.4x extender on it, the max aperture stays at f/4 where it should go to f/5.6.... I put the Kenko 1.4x with my 70-200 f/2.8 and it showed f/4 as it should. Weird? who knows but I'm not complaining for a 53-235mm f/4 IS lens! When I bought it new, the image qualtiy at some focal lengths was professionally unuseable - even at f11. I shot targets, wrote a nice, detailed letter, returned it to Canon for repair. They returned it no better. I repeated the whole process (it takes a long time to shoot a test chart series with a zoom lens). They returned it again. No improvement. I repeated the whole process AGAIN. This time they sent me a different lens. This one is a very good, professionally acceptable lens! What a difference. Based on the test results I see on this site, the slrgear tested lens is probably about like my first one. This experience is typical of most of my experiences with Canon lenses. I did get an excellent 100 macro and an excellent 100-400, both on the first try. That is an exception. When you get a Canon lens, assume it is junk, test it rigorously, continue to return it until they give you a really good one. Canon CAN make good lenses. INSIST that they give you a good one. It is very disappointing that Canon doesn't offer high quality apochromatic lenses. This lens doesn't perform any better (or even as well) as some of the better lenses on digicams <$1,000. And it is no better than the image quality I get from my 28-135 IS. Yes, its gives ok image quality for a hobbyist and casual user, but not good enough for true pro use. Its image quality is significantly inferior (mediocre resolution and too much chromatic aberration) to that of my view camera lenses. So where can I go for a truly good lens for my FF Canon cameras? Nowhere! PLEASE Canon, please start making and offering some lenses of true pro image quality. This lens stays on my 5D most of time. I like wide angle - and this lens is excellent in 24 -28 mm range. Better than for example EF 28mm F/2.8. At 50 mm my 24 -105 mm is very close to image quality of the EF 50mm F/1.8. Main lens on Canon 350D. Good lens for use everyday use. It is normally mounted on my camera. Well Build, IS works perfect, colors. Excellent build quality, IS is a dream to work with and nice colors. Not as sharp in corners, when compare to Tamron 28-75, but sharp overall. Smooth control, even with little strange for me position. Very useful range, and finally i thing a perfect pair to 70-200L f/4 and 17-40L f/4. This is my primary lens because of its focal length range, but especially because of its responsiveness. It just works and feels right. Most of my shooting is either candids or landscape. For the former, the focusing speed of this lens is its best attribute - focus is extremely quick and accurate, easily quick enough for anything I have been able to throw at it. Build and lens action (zoom, focus) are tight and silky smooth. I've now shot several thousand frames with this lens - it just works right. It takes physical punishment (snow, dust, rain) without missing a beat. I have a post-flare-fix (aka blue-dot) version of this lens, and have not seen any flare problems so far. I often use the lens hood, but even when I don't, flare is something I only see in EXTREME circumstances. At f4 above 100mm, unprocessed images generally do appear a bit soft. However, the same images take sharpening very well such that I have no worry about shooting wide open at any focal length. Canon's DPP software works well for that purpose, although DxO is my preference because of its comprehensive automatic corrections. Of course it would be nice if this were an f2.8 lens - but it isn't, so it seems pointless to yearn for something the specs explicitly disclaim. I love the 24-70L 2.8, but find that the extra focal length and IS of this lens cause me to use it more than the 24-70L. wish it were a bit wider and cheaper. I love this lens. The length works extremely well as the primary lens on a 1.6x body (20D). Sure, it would be nice if it were wider and faster, but still it's fantastic. I took an early one to Vietnam & Cambodia and people rave at the pictures. Visit www.berley.com and see for yourself. Mine is a pre-recall lens. Of the 2500+ shots I took on the trip, I experienced the flare problems in only one shooting situation. As I post this Canon, has decided to recall some of the earliest lenses. Something about "lens flare up" on the wider apertures and wider zoom. I have not seen this too much. I really can't stand to mail out my lens already. Its almost like a vehicle recall campaign. 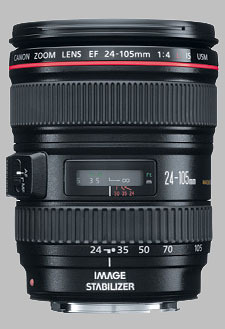 After much hoopla, the Canon EF lens, 24-105mm F4L USM is available. The supplies are limited, some stores are back ordered until late November 2005. Which much anticipation I waited to receive and try out this "walk around" lens. The features like Image Stabilizer is suppose to give the equivalent effect of a shutter three stops faster. The USM for fast, quiet focusing which it does. Manual focusing is available in autofocusing mode. Tight seals to ensure dust proof, moisture protection. This is true on my recent New England rainy trip. All of this is already available on other Canon L lens. This lens has been on my Canon 1D MK II for 18 days now. I like the lens, more for its size than its ability to provide sharp quality images. So far I kind would have liked this lens to have an constant aperture of 2.8. It does not do well in cloudy or darkly light subjects. The constant 4.0 opening tends to produce softer photos. The middle ranges are probably where I see better results. I write all of this with some hesitation. I am hoping with some real outdoors shooting that I will be a big fan of this lens. The quiet AF focusing is almost too fast. It makes it feel like the camera or lens has not reacted to the subject. Something that I have to get used to. Already owning the Canon 70-200mm 2.8L lens, I have to make some comparisons. Although this is a larger and heavier lens and more expensive, its does produce some quality photos. Being fair to the new 24-105 lens, I must give it some more time to win my confidence. As of this point Ihope that my investment will pay off. despite the flare issues, which canon is in process of resolving with a service recall, this lens is pretty much what i was hoping for. it has become my standard on my FF body all the time. its range is good and the image quality is outstanding. the addition of IS is just a nice plus. relatively light in comparision to my 24-70 2.8L. putting the lens hood attach point on the end of the lens allowing it to move with the zoom is a definate big plus over the older fixed designs (rather large) allows for a smaller hood too. this was a major complaint by many resolved. Lens flare a little more than I expected.